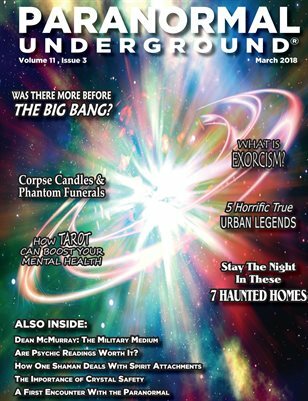 In this issue of “Paranormal Underground” magazine, we spotlight psychic Dean McMurray, known as the “Military Medium”; paranormal romance author Eve Vaughn; and how tarot can boost your mental health. We also cover the latest paranormal news. In our Case Files of the Unknown, we feature seven haunted homes that will let you stay the night, five urban legends that turned out to be true, and legends of corpse candles and phantom funerals. We also take a look at crystal safety, spirit attachments, and if psychic readings are worth your hard-earned cash. Also in this issue, don’t miss our coverage discussing exorcisms, if there was more before the Big Bang, a first encounter with the paranormal, a Q&A with spiritual medium Paul Henderson, and a paranormal investigator’s research into the existence of demons. Plus, read our latest dream interpretation that takes a peek under the skirt of reality.